The Wayne Inn in Honesdale, PA, is a 28-room hotel conveniently located in the county seat, at the intersection of Route 6 and Route 191, and nestled among the most amazing features the local area has to offer. Now open and accepting reservations, the Wayne Inn and its sister hotel, The Hotel Wayne, offer a combined 48 rooms with king and double beds, as well as catering for accommodating weddings, birthday parties, reunions, meetings, and other functions. You’ll also enjoy fine dining at one of the five restaurants in the Hotel Wayne Hospitality Group. 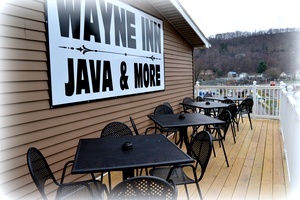 After undergoing complete renovations, The Wayne Inn now includes a lovely on site coffee shop, JAVA & More, which features premium and specialty coffees along with wine, and craft beers. JAVA & More also serves breakfast and lunch with indoor and outdoor seating. The Wayne Inn is a convenient and cost-effective answer to the growing demand in the area for top quality hotels in Honesdale, PA. Private meeting rooms are available at no additional charge and pets are welcome at no additional charge. The Wayne Inn also features a handicap accessible first floor, plenty of free parking, and free high speed Wi-fi. Our friendly and courteous staff is on hand to ensure your visit is as pleasurable and successful as possible. After visiting our inn and utilizing our numerous amenities, you’ll never want to stay anywhere else.